The dream of many Jewish couples is to retire to Israel. If they live in a cold climate, they imagine living in a place where there is often sunshine and warmth. They think about having a simpler life, spending time on the beach, or working in the garden. For some people, choosing the city in which to make a new home is easy. Those who yearn for the sea will choose the coast. Those for whom the idea of Israel has an intrinsic link to Jerusalem cannot imagine living anywhere else. Then there are the golf addicts who gravitate to Caesarea with its famed golf course. But for Hava Har Even, the decision to move to Safed was decided by a click of her computer mouse. Hava and her husband Shimon knew what they were looking for, but didn't know where it might be found until Hava, by chance, clicked on a link that led her to a computer-generated depiction of a house, poised at the edge of a precipitous "wadi" or gully. As Hava explains, this was a case of, "Admire, aspire, acquire." What was it about the image on the screen that so caught Hava's imagination in 2005? Hava and Shimon had already sat and made a list of their priorities for what they sought in a post-retirement home. A villa in Neve Oranim, in the city of Safed fit all their specifications to a T.
Hava, who was nearing retirement from her job as a legal secretary for a North London firm, along with Shimon, already retired, dreamed of buying an affordable home. This ruled out the kind of luxurious living accommodations found in Israeli cities like Savyon and Raanana. Safed would also afford the couple a life in the countryside with a garden, something they might not have had in a larger city. The Har Evens knew too, that in Safed, more religious, traditional Jews like themselves could feel at home, but would also live in peaceful harmony alongside secular Jewish families. To Hava, that villa on her computer screen "seemed to sit balanced between heaven and earth," summing up the special, indefinable quality of Safed that so appealed to her, the, "creative, artistic, slightly hippie atmosphere," and so, Hava had her answer: Safed, "the city in the sky." But there is more to the story of Hava Har Even. Once the couple was ensconced in their new digs, they began to explore the area using the local bus lines. 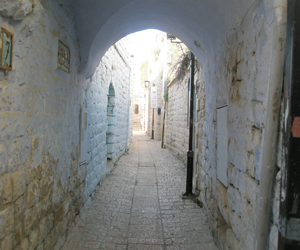 Hava was struck by the similarity of Safed to the English landscape so familiar to her. The "magic factor" that made the city a sound psychological fit for Hava was in its topography of hills overlooking a sea. To Hava, this felt almost like, "a seaside town on the moors or downs overlooking the English Channel near Brighton in East Sussex, England," where she'd been raised as an infant, wandering with her mother among, "the cornfields and poppies of the South Downs." As Hava put it, "I needed to get away from the city and seeing the landscape of my beginnings I felt spiritually at home."